Cue the fireworks! 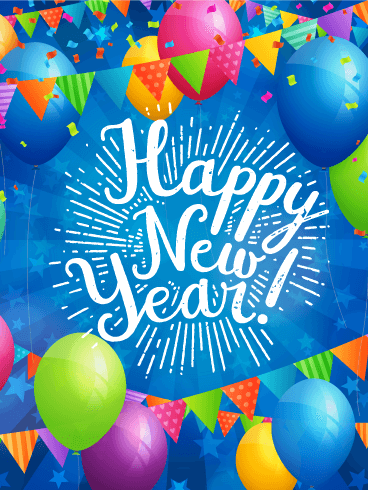 It's time to celebrate the new year! 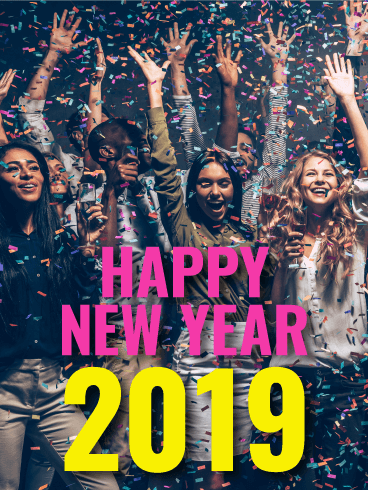 Help someone close to you ring in 2019 with this exciting card. The red cursive font really adds to the element of celebration, while the fireworks and sparkler make you feel like you're right in the middle of Times Square. 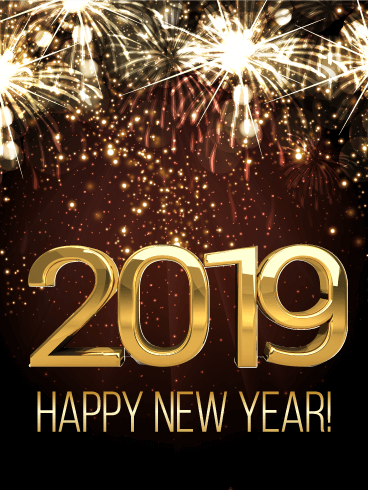 This New Year card is a great choice for anyone in your life! 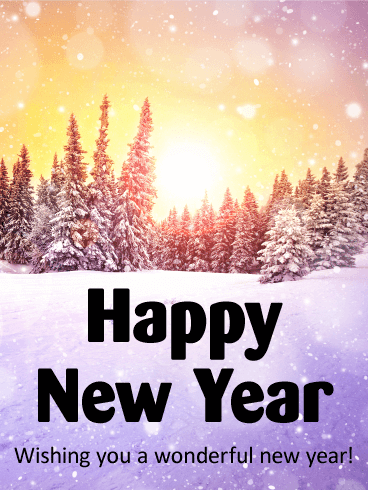 Send your love a beautiful card to celebrate the start of a brand new year! 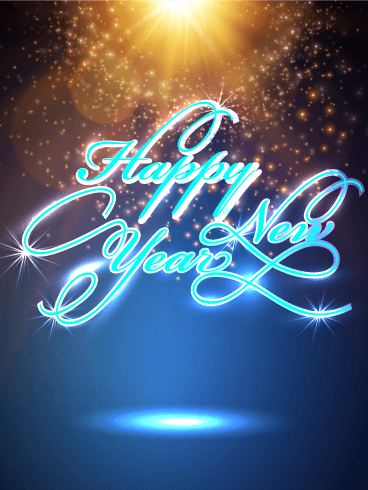 This Happy New Year card has a background filled with light pastel colors. 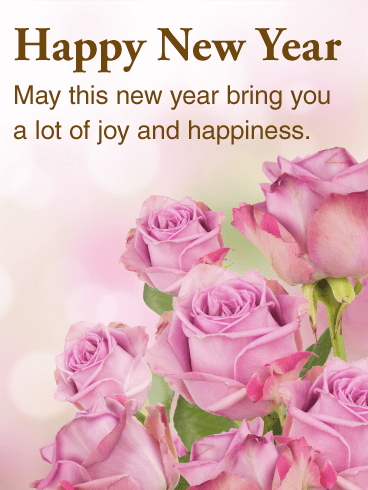 At the forefront of the card is a bouquet of beautiful pink roses, a promise of love and happiness for this New Year. 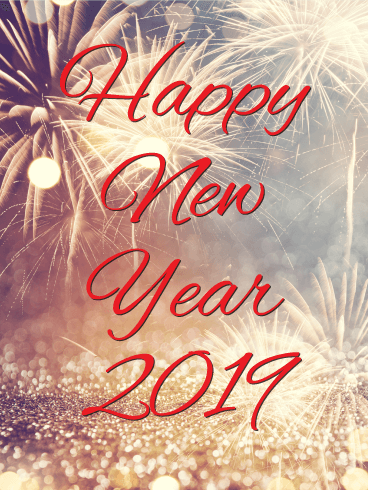 Let this card say, "Happy New Year - May this new year bring you a lot of joy and happiness." to the special someone in your life today! Add a touch of class to your family's New Year! The atmosphere of this Happy New Year card sets up the perfect year. Champagne and bubbles are the chic way to say goodbye to the past year and welcome the new one with open arms. Click glasses with your relatives, drink deep, and help them celebrate the holiday with style with these filled champagne flutes! Get your friends super excited about the New Year! 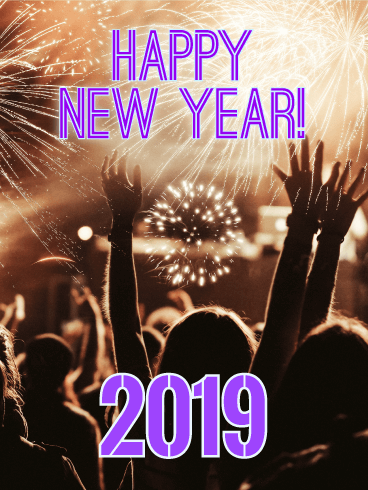 This card will have them waiting anxiously for the clock to strike midnight, eager to celebrate New Years Day and get a head start on all the fun and adventure the New Year promises. From January to December, this New Year card will ensure your friends will have plenty to celebrate in 2017! Raise your hands if you're ready to celebrate the new year! 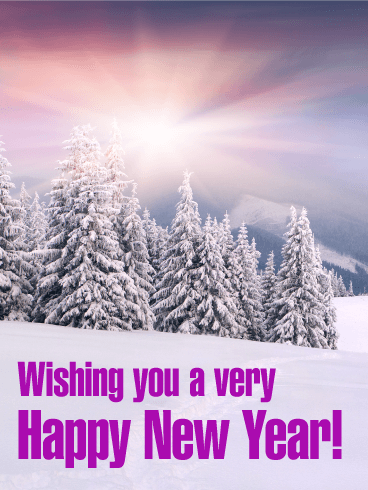 This greeting card is a unique take on a classic New Year card, with a fun mix of brown and purple colors. It'll make the recipient of the card feel like they're right in the middle of all the New Year's Eve hype! Let the good times roll! This New Year card to help ring in the new year is an absolute blast! After all, look at all those laughing, smiling faces! And what screams "New Year's Eve" more than bright-colored confetti?! 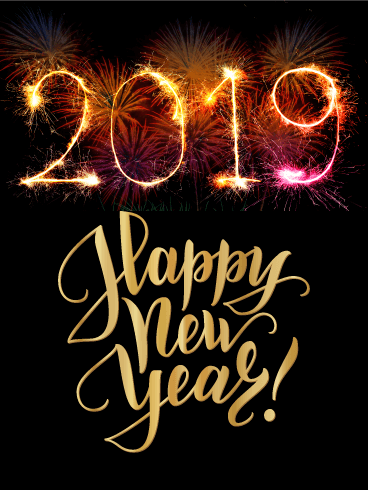 For any friend, family member, or colleague, this is the perfect New Year card to send to celebrate the start of 2019! Make your friends glow with happiness this New Year! As the stars shine behind this calligraphic script, make everyone sigh over memories and flutter with anticipation at making new ones with you. Light the night with sighs and laughs. 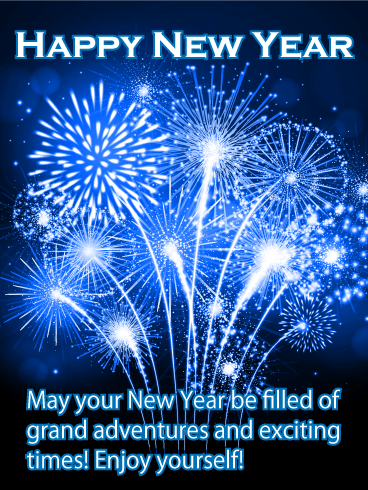 Use this New Year card to tell everyone last year was good, but next year will be amazing! Sending this New Year card will make them smile radiantly! As if fireworks on New Year's Eve weren't exciting enough, how about fireworks in the shape of 2019?! 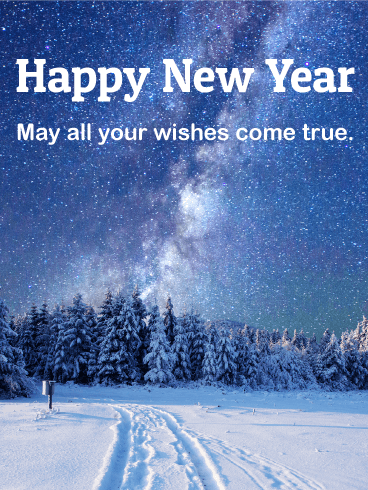 Maybe that isn't quite so simple, but this New Year card makes it a reality. 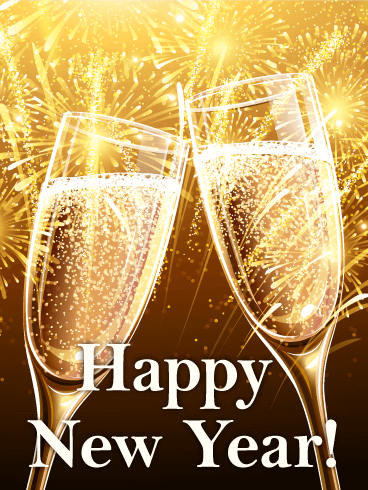 Gold is the perfect color to signify celebration, making this New Year card a stellar mix of fun and simplicity.